National Pasta Day: Celebrate with these 10 deals & freebies today! October 17 is National Pasta Day, and what better way to celebrate than enjoying a discount at your favorite pasta restaurant! Italian restaurants aren’t the only ones celebrating either. For example, you can enjoy a noodle night at P.F. Chang’s with free Chicken Pad Thai with any entrée purchase! No matter which type of pasta you like, there are plenty of deals to enjoy today! As always, be sure to call your local restaurant to be sure they’ll honor the deal. This restaurant is featuring all new pasta dishes and appetizer specials during the month of October. Plus, you can enter to win a trip to Italy for you and a friend! Head over to Carrabba’s for $10 Spaghetti Pomodoro, Linguini Positano and Fettucine Alfredo on October 17. 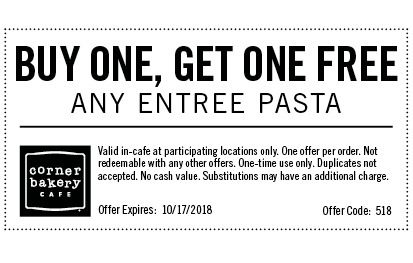 Enjoy buy one, get one free pasta entrées with this coupon at Corner Bakery! Note, this coupon is valid for dine-in orders only at participating locations. Get a free box of pasta on October 17 when you say “Lots a Pasta” at checkout. For a limited time, you can choose any specialty pasta, chef featured pasta or classic pasta and get a classic pasta to take home for free! Additionally, customers who sign up for the Maggiano’s E-Club get $10 off their next visit. Celebrate your love of pasta all month long at Olive Garden with its Never Ending Pasta Bowl promotion through November 18. Deals start at just $10.99! Enjoy a free Chicken Pad Thai with any entrée purchase when you show this coupon at P.F. Chang’s. This deal is available at participating locations through October 19. Head over to Romano’s Macaroni Grill today for buy one, get one free lunch today only until 4pm! This restaurant is also offering free meals to first responders through October 31. This deal is only valid at participating locations. Enjoy $5 off this two-pound box of organic red lentil pasta with code 289V17W9 on Amazon. This site is offering 20% off sitewide with promo code PASTADAY20 at checkout. RELATED: Free Food: 60 places to get free food via app or email signup!